It’s been nearly 24 hours and my fingers, despite many hand washings, still smell like onions. The scent of onions on my fingers is a metaphor of how volunteering is supposed to be. We shouldn’t forget the experience the day after. We need to avoid the “I did that, I can cross it off my bucket list or put it on my resume” kind of thinking that can so easily satisfy the thoughts of volunteers. People in need wake up day after day longing for relief from their despair. It’s somehow fitting if the scent of their struggle continues to emanate from the fingers of volunteers long after the experience. Helping people in need is messy. Dirty. Sometimes outright repulsive with stench. Literally and metaphorically. Their lives can be a big mess. There are odors associated with caring for people who can’t take care of themselves physically. The incarcerated and the poor don’t live in houses whose scent can be labeled as Ocean Breeze or Apple Meadow. In some cultures, the people who need our help have open sewers right outside their front door. The smell of onions on my fingers one revolution of the earth later is a bargain! The Chester County Food Bank does a wonderful job scheduling hundreds of volunteers to serve at the many farms they partner with across the county. 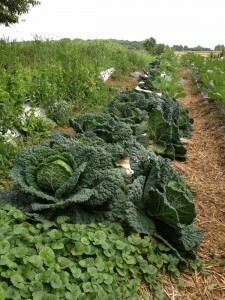 Volunteers plant, weed, and harvest throughout the various seasons of the year. Individuals, nonprofits, and businesses, as well as those ordered by the court, all donate their time to help their neighbors who cannot afford to eat. A walk through their state-of the-art and amazingly clean facility in Exton, PA leaves you with the impression of an organization that knows exactly how to provide nutritious and safe meals for thousands of families – day after day. With the money they have invested in their efficient systems, the charity could have bought thousands of processed and ready to eat meals for families from Oxford to Pottstown. However, once those meals are consumed, the food storehouses would be empty and the families will be hungry once more. Instead, they invested the funds into farming –planting seeds, cultivating the plants, and then harvesting corn, squash, eggplant, tomatoes, cabbage, lettuce, onions, and more vitamin and nutrient rich vegetables in order to feed thousands on a long-term basis. Volunteers will get dirty. They will get pricked and scratched by thorny weeds. But that is fine – that is what volunteering is really about – getting dirty and exhausted day after day so that others can recover from adversity in life. May the onion smell on your fingers remind you for days after you volunteer that it will be a joy to do it again because the need never goes away. Onions before we removed the stalks, along with 8 other volunteers. Onions after we removed the stalk at Pete’s Produce Farm, volunteering on behalf of Chester County Food Bank.